A delay in the rollout of solar farms following the collapse of contractor RCR Tomlinson may prompt a rise in power bills as a “drought” of large-scale renewable certificates extends into next year, piling pressure on ­prices. The unexpected fall of RCR has sparked a wave of uncertainty in Australia’s booming solar market after a huge cost blowout at two Queensland solar farms it was building and amid the revelation RCR’s board hired adviser McGrathNicol to consider ­administration three months ­before last week’s appointment. The price warning looms as a potential extra bill impost when the federal government is desperate to lower tariffs for retail customers throughout the country. 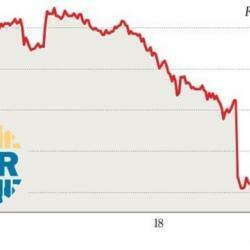 “Apart from the direct impact to subcontractors and solar developers, the development has the potential to add to consumers’ electricity bills,” renewables ­trader Demand Manager told The Australian in reference to RCR’s collapse. The price of large-scale renewable certificates, which are produced for each megawatt of ­renewable power and are added to electricity bills, are trading at $63 this year and are set to remain at a steep curve of $57 in 2019 before falling to $28 in 2020 and $19 in 2021, ­according to its analysis. “The price curve is effectively saying that there will be a relative shortage of certificates in 2018-19 — a ‘drought’ — and then a relative surplus from 2020 onwards — a ‘flood’ — as these solar projects come online,” Demand Manager owner Jeff Bye said. With RCR involved in constructing solar farms with an estimated combined capacity of 1000 megawatts, the knock-on impact of yet-to-be-completed projects is now reverberating within the booming industry. Work by RCR on the expansion of Western Australia’s Greenough River solar project has been halted subject to decisions on the contract or advice from ­administrators, a spokesman for the state Energy Minister Ben Wyatt said. The state-owned Synergy holds a 19.9 per cent stake in Bright Energy and the balance is owned by superannuation giant Cbus and the Dutch Infrastructure Fund. There “was always going to be teething problems in the ­industry going from zero to hero in the space of a few years”, Mr Bye said. About 3400 megawatts of utility scale solar is expected to be installed this year and 4300 megawatts next year, according to the Clean Energy Regulator. The combined 7700 megawatts, or about 25 million solar panels, is being “installed by an industry that was virtually non-existent a few years ago”, Mr Bye added. The fresh revelation of problems earlier this year within RCR before a critical $100 million capital raising was conducted on August 28 also raises fresh concern about the timeline of the company’s issues. McGrathNicol said it was ­engaged by RCR on August 14 “to provide assistance in assessing the short-term cashflow forecast and the forecasting process” and to “undertake contingency planning for a potential appointment of voluntary administrators” to RCR, according to documents filed with the Australian Securities & Investments Commission. They detail how it held a meeting with RCR chairman Rod Brown to understand its ­financial position and started work on August 15 with a draft short-term cashflow report sent to RCR on August 23.